Are comics the “gateway drug to literacy?” Here’s how they can boost your child’s literacy skills, and how their cartoony fonts and illustrations helped my young daughter, Olive, learn to read. 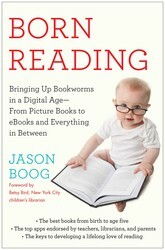 From Born Reading: Bringing Up Bookworms in a Digital Age–From Picture Books to eBooks and Everything in Between. In grade school, I literally dissected the full-color Sunday morning comic pages in the Detroit Free Press. I would cut out Bloom County, Garfield, Calvin and Hobbes, and other classic comics, pasting the strips into photo albums like rare artwork. I moved on to comic books a few years later, collecting Wolverine, Spider-Man, X‑Men, and a few other series with my allowance. I’m excited to share these comics with Olive someday, but in the meantime, I’ve found some amazing comic books for kids. New Yorker art editor Françoise Mouly has championed comic book creators for most of her professional life. She co‑edited the legendary RAW comics anthology with her husband, Maus author Art Spiegelman. She told me that too many parents have a bad attitude about comic books. She traced this prejudice back to the legacy of an old anti–comic book crusade that profoundly changed the landscape of American children’s reading. “There was a moment in the 1950s where 94 percent of kids growing up in America, boys and girls, were reading comics,” she told me. Then, in 1954, a doctor named Fredric Wertham published Seduction of the Innocent, a nonfiction book that blamed comic books for juvenile delinquency and prompted a congressional crackdown on the medium. “They did the same thing with rock and roll and they did the same thing with video games. It’s something that scares the grown-ups and the parents when all of the kids are absorbed for hours with a medium,” Mouly said. Pushing back against anti–comic book forces, Mouly founded TOON Books in 2008. This Candlewick Books imprint specializes in gorgeous editions of comic books for kids. Her husband once summed up the simple power of a great comic: “Comics are a gateway drug to literacy.” Using great artists from around the world, TOON Books bridges the gap between picture books and superhero comic books. Comics can literally teach your child how to follow a story on a page, a valuable skill for kids figuring out how to decode books. One-year-olds can handle Silly Lilly or Jack and the Box, the pages filled with simple frames and a small series of actions. But don’t let age limits slow you down. As a two-year-old, Olive obsessed over The Shark King by R. Kikuo Johnson, a folklore-inspired story about a shape-shifting shark man. Even though the book was intended for much older kids, Olive loved the fairy tale imagery and didn’t blink at the magical plot. Olive also devoured The Big Wet Balloon by Liniers, a book about two sisters exploring their backyard during a summer rain. At the end of the book, the author includes a photograph of his real-life daughters with a homemade drawing that inspired the story. 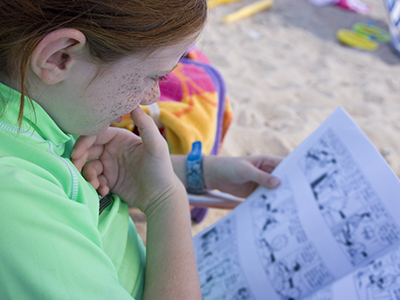 Comic books are perfect for practicing early literacy skills. Parents can point out short, capitalized letters inside comics. Phrases like “Bang!” “Ha,” or “Yaaaa!” punctuate action scenes inside these adventure books, and your child will love reading the letters out loud on the page. You can see these exuberant comic book fonts in the work of Mo Willems too. In Pigs Make Me Sneeze!, Willems’s elephant sneezes for 30 pages. The running gag is that his “a-a-a-a-a” presneeze gets longer and the mighty “CHOO” gets louder every time. The letters get bigger and bigger as the book gets sillier and sillier. While taking a bath, Olive reenacted Pigs Make Me Sneeze. Surrounded by bubbles, she giggled like crazy going “Ah-CHOOO!” as I pretended to be blown away by her sneeze. By the time my wife tucked her in that night, Olive had no problem identifying these letters written in cartoony fonts. A program for parents and professionals on how to raise kids who love to read, featuring interviews with childhood development experts, advice from librarians, tips from authors and children’s book publishers, and reading recommendations for kids from birth up to age five. Every parent wants to give his or her child a competitive advantage. In Born Reading, publishing insider (and new dad) Jason Boog explains how that can be as simple as opening a book. Jason Boog was a publishing editor at Mediabistro and lead editor of their popular blog on all things publishing, GalleyCat, for five years. His writing has been featured on NPR and in the Los Angeles Review of Books, The Believer, and Salon. A graduate of the University of Michigan, Boog lives in California with his wife and daughter. Visit him at JasonBoog,com.